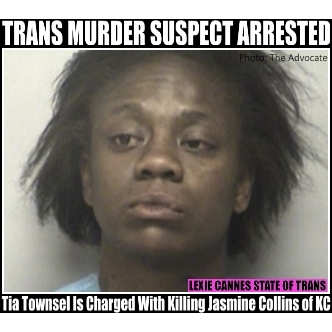 LEXIE CANNES STATE OF TRANS — Friends of the trans murder victim, Jasmine Collins, suspected something was up over the ten days she was missing — some even suspecting she may have been murdered. Kansas City, Missouri police, however, knew of her death from that first day, and so did at least two local TV stations who reported it. However, because the police based her ID on state-issued identification, the victim’s trans status flew under the radar. The trans community didn’t find out until an advocate, Kris Wade of the Justice Project, inquired. As it turned out, the police already had a suspect for the June 23rd murder in custody by that time — Tia Townsel. News reports say there was a fight between Townsel and Collins with the latter ending up on the ground, stabbed 3 times. Townsel prevented witnesses from giving CPR. Townsel was charged with second-degree murder. The UK’s The Guardian first reported the victim as transgender. It was Dawn Ennis of The Advocate that brought this story to my attention. This incident underscores the need for the tracking of trans murder victims — we can’t always rely on UK media to do the job for us.